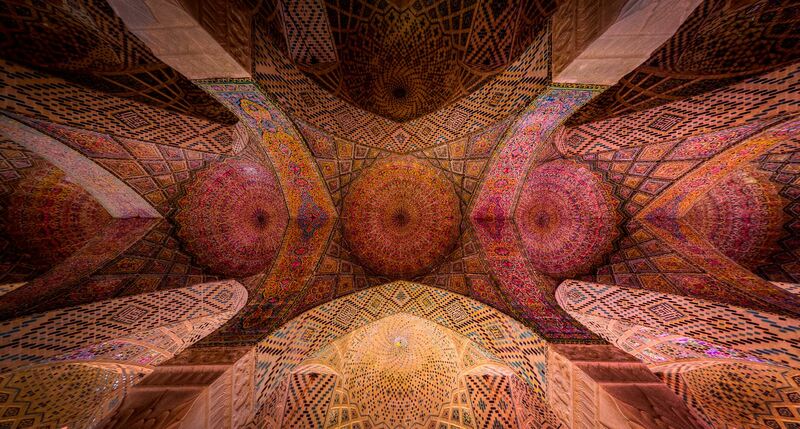 In fall and winter seasons when sunlight shines through the colorful glasses, it presents as exemplary beauty to the interior of the bedchamber, making this mosque outstandingly aesthetical among other mosques of Iran. The tiling and paintings of the bedchambers are of exceptional beauty as well. From the start of dawn the mosque is filled with colour and light. Sun shines through the glass and fills the inside, the persian rugs, the ceiling and wall tiles with patterns and colours. I am so amazed at how the architect was able to combine so many things to build such an exquisite mosque. I went to this mosque on a winter morning, and waited for the light that moves gently from the right hand side of the mosque towards the left, to fall exactly in the centre so that my photograph could be completely symmetrical.